For his first directorial assignment at RKO Radio, Edward Dmytryk was handed the mile-a-minute topical meller Seven Miles From Alcatraz. 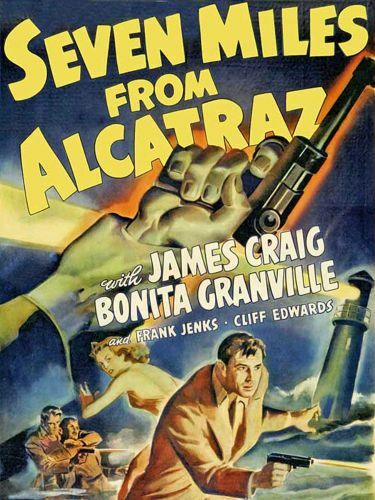 James Craig and Frank Jenks star as cynical Alcatraz inmates Champ and Jimbo, who manage to escape from the "rock" and then take refuge in the lighthouse maintained by Captain Porter (George Cleveland) and his pretty daughter Anne (Bonita Granville). Though concerned only about their own plight at first, Champ and Jimbo alter their getaway plans to foil a nest of Nazi spies who are using the lighthouse as their rendezvous. As Jimbo explains it, "We may be rats, but we're American rats! ", which may be why he and Champ are granted a happier denoument than most Alcatraz escapees. Among the Nazis is a slim and youthful John Banner, two decades removed from his duties as cuddly Sergeant Schultz in TV's Hogan's Heroes.